Apple Inc has yet again released another of its high-end, reputed smartphone with its unique iOS software. It has come up with the next phone in the series; the iPhone 5s with much better touch sensitivity and a highly advanced processor supported by a high-end co–processor too. This smartphone was announced sometime in the first week of September 2013. Later on, it was released on the market in mid-September, 2013. In India though, it was first available from 1st of November, 2013. The previous version of this smartphone is the iPhone 5 which had a few drawbacks to it. This 5s version had almost rectified the problems. iPhone 5C is a related phone but with lesser price. 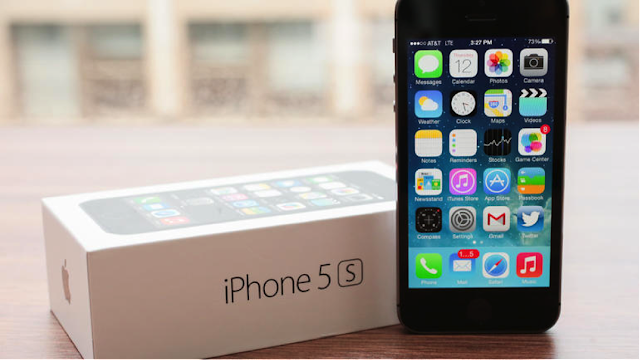 The iPhone 5s mostly targeted to the middle class and upper middle-class customers. Those people who are so much used to ‘i’ products would be the primary buyers of this smartphone. The USP of this smartphone is its unique design, high-end processor and its durability. Now, let us discuss the other technical specifications of this smart phone and analyse its pros and cons eventually. This smartphone is no different regarding look and build from its previous models. It has its classy supreme sleekness with the good curved edges and soft body. This gives the phone a very premium look. Also, it’s entirely metallic back makes it slightly slippery. It comes with a length of 123.8 mm and a breadth of 58.6 mm. It has a thickness of a mere 7.6 mm and weighs less. It only has an average weight of 112 g. This makes this smartphone very handy and easy to operate. The display in this phone is a 4-inch retina display. It comes with an LED –backlit widescreen additionally having a Multi – Touch features working on the IPS display technology. It comes with a pixel resolution of 1136 x 640 pixels. The contrast ratio is 800:1. The protection to the screen is given by the Corning Gorilla Glass that is Fingerprint resistant & oleophobic coating for the front display. The maximum brightness is approximately 500 cd/m2. It comes in the classic three colours that every iPhone has been released in, i.e., Silver, Gold and Space Grey. iPhone 5S functions on the famous iOS 7 and this is upgradable to iOS 9.3 later after purchase. The chipset used in this phone is the Apple A7. This comes with a 64-bit processor which takes care of all the processing action within the phone. This 64-bit processor helps run all the high-end apps without much lag. A Dual – Core Cyclone processor, based on the ARM V8 technology is combined with motion co – processor, M7 for this purpose. The clock speed of the dual-core processor is 1.3 GHz. The graphics interface is dealt using the Power VR G6430. The internal storage options available are 16 GB, 32 GB and 64 GB. There is no option of expandable storage using a micro SD card. The RAM used here is a 1 GB DDR3 type. The primary camera in iPhone 5S is 8 MP iSight camera with 1.5-micro pixel clarity. It has an aperture focal length of f/2.2 and a wide angle of 29 mm. It comes with a 1/3 inch sensor and a Dual LED flash. The additional features to support the camera are touch focus, geo-tagging, HDR amongst many others. The front camera is around 1.2 MP with an aperture of f/2.3. It also has a wide angle of 31 mm. It comes with enhancement features like FaceTime over Wi-Fi and face detection. The video recording in this smartphone is better with the back camera. Videos of 1080 p at the rate of 30 fps can be recorded using the primary camera. The front camera can record with a resolution of 720 p at the rate of 120 fps. The audio clarity is very mediocre in this smartphone. It doesn’t have a functional FM Radio feature. The power to Apple iPhone 5hs comes with a non–removable, Li – Po battery. It has a capacity of 1570 mAh. The power rating for this battery is 5.92 Wh. The standby time is up to 250 h in both 2G and 3G modes. It has a talk time of up to 10 h. This phone comes only with one sim facility. The sim should be a Nano sim. It works only on GSM network. It is compatible with both 3G and 4G modes. It also has the basic wireless connectivity features like Wi-Fi and Bluetooth v4.0. The iPhone 5s has got wrong advantageous features like fantastic home button with cut sapphire crystal sensing for the Touch ID option. It also comes with an amazing processor and a co – processor. The primary camera is good too. The disadvantages though are its low RAM, battery and slightly high cost.